Quick programming note: We'll be covering the birthday service in Britain tomorrow, so our post will be up later than usual! Our look at Queen Rania's small Boucheron tiara last month reminded me of one particularly interesting diadem in the Jordanian royal family. It's a tiara that I often forget about, only to fall in love with it all over again every time it's mentioned. This tiara belongs to King Abdullah's stepmother, Queen Noor. Queen Noor is one of the few royals with an American background. Born Lisa Halaby in Washington, D.C., she studied architecture and urban planning at Princeton and her work eventually introduced her to King Hussein of Jordan. She became his fourth wife in 1978, adopting the name Noor Al-Hussein ("Light of Hussein"). They had four children together and were married until Hussein died in 1999. A queen consort requires a tiara, and Queen Noor wore this contemporary diamond design for almost all of her tiara occasions. The tiara features diamond rays with variation provided by larger diamonds dotted throughout and on top of the rays. Early photos of the tiara show a design closely resembling that of a traditional diamond fringe tiara, where the rays are graduated towards a single tall center point (above). Noor seems to have altered the tiara to her tastes fairly early on. It was adjusted so that the rays graduate in height between several taller points, adding variation to the top line and moving it away from that classic fringe shape. The end result feels like a diamond fringe tiara met and fell in love with the Girls of Great Britain and Ireland Tiara, combining two of my favorite tiara styles. It has the same feel as Queen Alia's Cartier Tiara, worn by King Hussein's third wife, and also reminds me a little of the Japanese Pearl Sunburst Tiara. 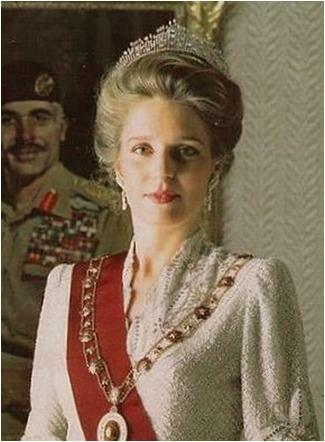 Queen Noor has understandably moved away from most state occasions since King Hussein passed away. 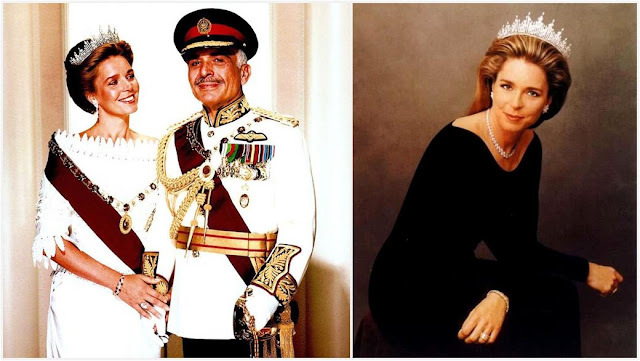 (As a tangential note, her son Prince Hamzah was originally named crown prince to King Abdullah, but the Jordanian rules of succession allow the king some flexibility to name his heir, and the title was eventually removed from Hamzah and later granted to Abdullah's own son.) This means that the tiara is a little bit unused at the moment - hence my tending to forget about it. I'll be happy to fall in love once again whenever it reappears. Are you fancying this fringe-ish diadem?